1 Review Found. Use search to find more reviews or follow the links in the review text. 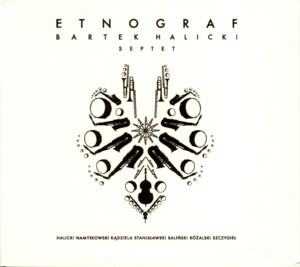 This is the debut album by young Polish Jazz trombonist / composer Bartek HalickiFind albums by this artist recorded with his septet which also includes trombonist Jacek NamyslowskiFind albums by this artist, saxophonists Maciej KadzielaFind albums by this artist and Dariusz StanislawskiFind albums by this artist, pianist Marcel BalinskiFind albums by this artist, bassist Rafal RozalskiFind albums by this artist and drummer Karol SzczygielFind albums by this artist. The album presents seven compositions, the first four of which are grouped together into a Jazz Suite. Although not specifically mentioned on the album´s artwork, the compositions and arrangements are assumed to be all by Halicki. The music is an ambitious project amalgamating many stylistic Jazz elements, starting with traditional Jazz from the early 20th Century, Bebop and modern European Jazz, as well as Folkloristic themes and Big Band / Orchestral arrangements. The result, although kept well within the mainstream Jazz idiom, is fresh and full of youthful energy and offers a most pleasant musical experience. The septet performances and the excellent arrangements are able to achieve a big orchestral sound, which creates an illusion of a much bigger group of musicians being involved in the process. With solos played in parallel by several musicians and multilayered melodic division skillfully intertwined, the music makes a potent impression and forces the listener to pay attention to the many details happening at once. In spite of the young age of most of the musicians involved in this project, it is immediately obvious that they are all well educated and schooled, and most importantly enjoy the opportunity to play music together, which evidently influences the end result. Their fluency and knowledge of the Jazz tradition and its many sub-genres is impressive indeed. But as usual it is the cooperation between the septet members which is the most important factor leading to the success of this music. Since larger Jazz ensembles become less and less popular over time, for a variety of reasons: economic, logistic and artistic, it is a real joy to see a successful septet doing such a splendid job. Hopefully Halicki will be able to continue his large ensemble passion in the future as well. Overall this is an impressive debut album, which offers both excellent compositions and exciting performances, as appropriate for the young Lions of Polish Jazz, and which should keep Jazz connoisseurs happy anywhere on this planet. Warmly recommended! This site was designed and developed by Adam Baruch. All content (texts, photographs, graphics, sound files, etc.) on this web site © 2001-2019 Adam Baruch / Jazzis Ltd.